Spontaneous limitation descemet's membrane detachment and new-onset HSK following phacoemulsification. Citation: Liu Y, Bin X. Spontaneous limitation descemet's membrane detachment and new-onset HSK following phacoemulsification. J Clin Ophthalmol. 2017;1(1):19-22. Descemet's membrane detachment (DMD) is not an uncommon complication after cataract surgery but the incidence following phacoemulsification surgery is very low (0.5%) . Postoperative herpes simplex virus (HSV) keratitis has been documented in the literature after various procedures. Herpetic keratitis after cataract surgery, however, is a much less reported event. Here we describe a patient who suffered both spontaneous limitation DMD and new-onset herpes simplex virus keratitis following uncomplicated phacoemulsification surgery, and discuss the relationship and possible reasons for these two complications. An 86-year-old woman presented with a gradual loss of vision in the left eye. Examination of the left eye revealed 0.05 corrected visual acuity, and a cataract with grade 4 nuclear sclerosis. The patient underwent uncomplicated phacoemulsification cataract surgery under topical anesthesia with superior temporal cornea incision. The patient denied any past ocular infection or inflammation, including herpetic eye disease. She had no past ocular disease or trauma history. She had a medical history of diabetes and mild bronchial asthma. The patient was taking oral medication for diabetes, but she was not taking any medication for bronchial asthma. On postoperative day one, her uncorrected visual acuity was 0.2, and her intraocular pressure was 20 mmHg. The cornea of operation eye was slight edema. The anterior chamber was deep with cells 2+. She was instructed to use Tobradex eye drops and Pranoprofen eye drops every two hours for one week, and then four times a day thereafter. The cornea edematous was even more serious with Descemet's folds when she visited our clinic five days later. The patients complained of a foreign body sensation and visual disturbances, the uncorrected visual acuity was FC/40cm. The slit lamp exam revealed DMD at the Para central area, with the Descemet’s membrane separated less than 1 mm from the corneal stroma. 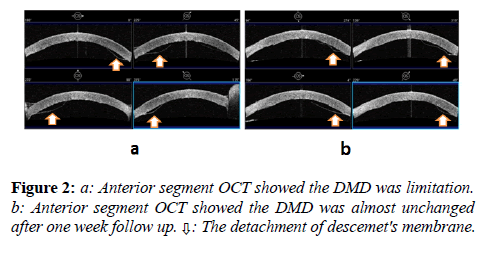 (Figure 1) The further examination with anterior segment optical coherence tomography (OCT) found the detachment of descemet's membrane was limitation and not located adjacent to the incision wound. (Figure 2a) Because the size of the DMD was small and location, we decided to observe the patient for another week without surgical intervention. During the follow up period, an intracameral air injection was needed because the size of the DMD unchanged and the patient’s vision unimproved. (Figure 2b) On the next day, the patient underwent an intracameral air injection in the operation room. (Figure 3a) One day after the intracameral air injection, her uncorrected visual acuity was 0.3 and her intraocular pressure was 16 mmHg. The corneal edema had decreased significantly. The Descemet's folds remained but the endothelium was successfully reattached. (Figure 3b) One week after the air injection, her corrected visual acuity was 0.8 and anterior segment OCT showed Descemet's membrane was successfully reattached (Figures 4a and 4b). Tobradex eye drops and Pranoprofen eye drops were reduced to three times a day. 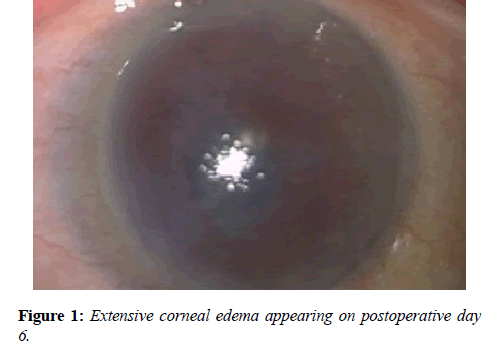 Figure 1: Extensive corneal edema appearing on postoperative day 6. Figure 2: a: Anterior segment OCT showed the DMD was limitation. b: Anterior segment OCT showed the DMD was almost unchanged after one week follow up. ⇩: The detachment of descemet's membrane. Figure 3:a: The patient underwent an intracameral air injection. b: One day after the intracameral air injection. : the bubble in anterior chamber. Figure 4: a: One week after the intracameral air injection. b: Anterior segment OCT showed Descemet's membrane was successfully reattached. Two weeks after the intracameral air injection, the patient presented with epithelial lesions on the left eye (Figure 5a) associated with photophobia and pain. Drug-induced keratitis was diagnosed because of the long time topical anti-inflammatory eye drops. The patient was started on topical 1% Liquigel (sodium carboxymethylcellulose) 4 times a day and the topical regimen of Tobradex and Pranoprofen was discontinued. Three days later, slit-lamp examination showed a geographic ulcer with dendritiform branches (Figure 5b). The diagnosis of HSV keratitis was based on clinical characteristics of classic dendrite and geographic ulcer. The ulcer was cultured and subsequently came back positive for HSV type 1. The patient was placed on oral acyclovir 800 mg 5 times a day and topical Ganciclovir Ophthalmic Gel 4 times a day. By day 7, the dendrites had resolved, with considerable improvement in pain, and his BCVA had improved to 0.5 and an IOP of 16 mm Hg. On day 14, the cornea lesions had completely healed, with BCVA 0.8 OS IOP 15 mm Hg. Ten months later, the cornea was clear, the recurrences of the HSV infection was not observed (Figure 6). Figure 5: a: Epithelial lesions on the left eye two weeks after the intracameral air injection. b: Slit-lamp examination showed a geographic ulcer with dendritiform branches about one month after phacoemulsification. ⇩: geographic ulcer; ↑: dendritiform branches. 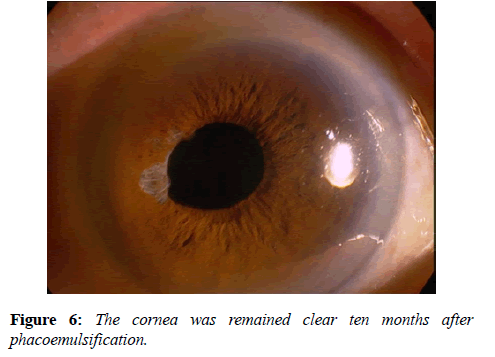 Figure 6: The cornea was remained clear ten months after phacoemulsification. In this article, we report a patient, who suffered both spontaneous limitation DMD and new-onset herpes simplex virus keratitis following phacoemulsification surgery. An extensive literature search using MEDLINE found no previous descriptions of this. In this case, the DMD was particularly unusual from several perspectives: (1) The occurrence of DMD was delayed, (2) The occurrence of DMD was spontaneous, (3) The detachment of Descemet's membrane was limited, (4) The DMD was not located adjacent to the incision wound. The DMD can develop at any time during surgery and its early identification is crucial to avoid membrane rupture membrane or even removal . In our case, the DMD was spotted at day 6 after surgery. Why the DMD can happen day 6 later after surgery is still unknown. The unusual DMD of this case also leads us to suspect endothelial trauma during cataract surgery, although we do not recall touching the endothelium with surgical instruments during surgery. The possible reasons for this delayed DMD also may relate to the predisposition to Descemet’s membrane separation and the unpredicted damage of phacoemulsification energy. Several mechanisms have been proposed as the possible causal mechanism for DMD: shallow chambers, complicated or repeated operations, inadvertent insertion of instruments between the corneal stroma and Descemet’s membrane, anterior and shelved incisions, and the use of dull blades. Mackool classified DMDs into a planar type, with the Descemet’s membrane separated less than 1 mm from the corneal stroma, and a non-planar type, with a separation of greater than 1mm. They reported that planar detachments are more likely to resolve spontaneously, and non-planar detachments should be repaired early . The case in our report showed planar type DMD. That is reason why we decided to observe the patient for one week without surgical intervention.Anterior segment OCT is useful in precise evaluation of DMD configuration and choosing the treatment method . In this report, we also used the anterior segment OCT to diagnose the DMD. While DMD may be evident upon slit lamp examination, anterior segment OCT provides a definitive diagnosis and serves as an effective method to monitor microstructural changes in the cornea over time. A wide variety of stimuli have been found to be able to stimulate the reoccurence of HSK, including febrile illnesses, stress, menstruation, sunlight, heat, and trauma. Such trauma includes penetrating keratoplasty and cataract surgery, especially when combined with postoperative topical corticosteroid therapy. HSV keratitis after ocular surgery has been well documented in the literature; however, new-onset HSV keratitis after cataract surgery is a rare complication. Miyajima  reported a case of new-onset HSV keratitis, confirmed by DNA detection in the tear film, more than 1 month after uneventful cataract surgery. Barequet  and Patel  recently reported 4 cases of HSV keratitis after cataract surgery in eyes with no history of herpetic disease. Our case of new-onset HSV keratitis after phacoemulsification surgery is unique because it happened following the reattachment of Descemet's membrane. The HSV keratitis after DMD is more complicate than HSK after phacoemulsification and which are the key factors such as DMD, phacoemulsification, glucocorticoid eye drops and the general disease, may need further investigation. Glucocorticoid enhances herpetic infection, and surgical incision of the trigeminal nerve has been shown to reactivate latent HSV in humans. Therefore, in this case the onset of HSV keratitis was likely to be triggered by the surgical trauma and steroids, the age of the patients may also affect the happen of the newly acquired HSK. In conclusion DMD is of concern to any surgeon who enters the eye with a surgical instrument, and it is a remediable but potentially blinding cause of postoperative corneal edema. DMD and HSV keratitis is an uncommon complication after cataract surgery. Ophthalmologists should be aware of the possibility of DMD and developing HSV keratitis even after the most routine cataract extraction. This work was sponsored by Project supported by the National Natural Science Foundation of China (Grant No.81070705), the Zhejiang Provincial Natural Science Foundation of China (Y2090193), and Zhejiang Province Key Lab Fund. Khng CY, Voon LW, Yeo KT. Causes and management of Descemet’s membrane detachment associated with cataract surgery - not always a benign problem. Ann Acad Med Singapore 2001;30:532-5. Agarwal A, Jacob S, Agarwal A, et al. MA.Iatrogenic descemetorhexis as a complication of phacoemulsification. J Cataract Refract Surg 2006;32:895-7. Mackool RJ, Holtz SJ. Descemet Membrane Detachment. Arch Ophthalmol. 1977;95:459-463. Wylegała E, Nowińska A. Usefulness of anterior segment optical coherence tomography in Descemet membrane detachment. Eur J Ophthalmol. 2009 Sep-Oct;19:723-8. Miyajima S, Sano Y, Sotozono C, et al. Herpes simplex keratitis after ophthalmic surgery. Nippon Ganka Gakkai Zasshi. 2003;107:538–2. Barequet IS, Wasserzug Y. Herpes simplex keratitis after cataract surgery. Cornea. 2007;26:615–7. Patel NN, Teng CC, Sperber LT, et al. New-onset herpes simplex virus keratitis after cataract surgery. Cornea. 2009;28:108-10.